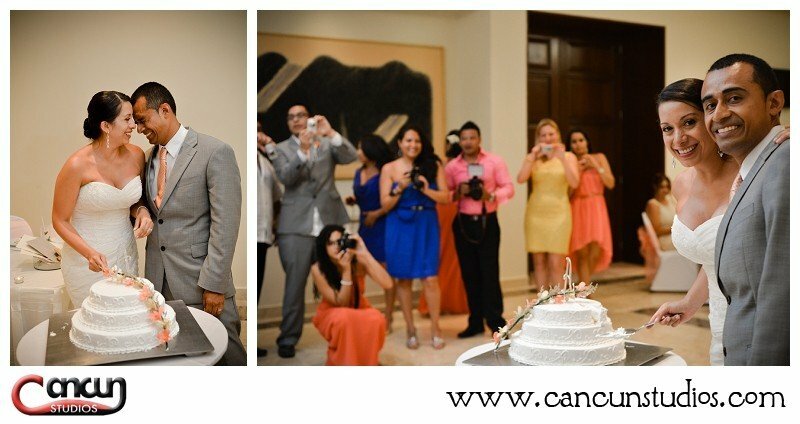 Cancun Studios Photographers » Civil Ceremony? Church Ceremony? or why not BOTH! Civil Ceremony? Church Ceremony? or why not BOTH! While planning your destination wedding in the Riviera Maya, one of your concerns may be whether to have a civil ceremony on the beach or a religious ceremony in a church. What you may not know is that many resorts in Cancun, Riviera Maya and Tulum, have chapels onsite which will allow you to have a double ceremony so you have your dream wedding on the beach plus honor tradition and have a religious ceremony in a church as well. Our lovely wedding couple chose Dreams Tulum as their wedding venue and had a large group of guests join them on the white sandy beach for their symbolic ceremony then had an intimate group of family and friends for the religious ceremony immediately after. Guests were entertained by a cocktail hour and live music while the ceremony took place. Our New Jersey couple had an amazing wedding with a Salsa Dj playing a great mix of music that kept the party going with lots of twirling and whirling going on. We were lucky to have been included to share their day! Dreams Tulum is a great venue to have a beach ceremony and church ceremony.